← What is Turntaking in Dialogue? How Would Siri, Google Assistant Improve With Better Turntaking? Wait until it claims to be ready. Now speak a single sentence without any pauses or hesitation. If you change your mind half way you MUST finish anyway and start with step 1 again. If it misunderstands anything you MUST finish anyway and start with step 1 again. If it needs clarification you MUST finish anyway and start with step 1 again. Whatever you want you must ALWAYS finish anyway and start with step 1 again. Say “oh no, start again”. Ask the robot to repeat the question. …and many other demands which are completely unreasonable given the ability of Siri. However by improving robot’s turntaking ability these demands might not be so unreasonable in the near future. 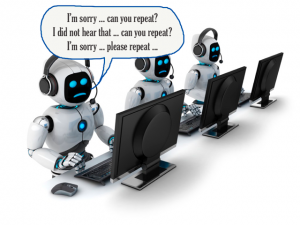 With improved turntaking robots could processed these interruptions or pauses and it would allow them to give an appropriate response even when interrupted in the middle of a sentence which invariably the general user will continue to do. The CoCoMaps project proposes to improve the turntaking ability of robots technology which will allow communication between humans and robots to flow much more naturally as described in our last post.